Home/Science of Sound/Sounds in the Sea/How will ocean acidification affect ocean sound levels? The amount of carbon dioxide in the atmosphere has increased since the mid- 19th century, the beginning of the Industrial Age. The burning of fossil fuels (oil, coal, and natural gas) and wood produces carbon dioxide gas. The increased use of fossil fuels has produced a rise in atmospheric carbon dioxide levels. This has resulted in increased dissolved carbon dioxide in the ocean, forming carbonic acid and making the ocean more acidic. Atmospheric carbon dioxide (CO2) from Mona Loa vs time (red line) with CO2 concentrations in the nearby ocean at Station Aloha (dark blue line) and surface ocean pH from Station Aloha over the same time (light blue line). Figure from NOAA, modified after R.A. Feely, Bulletin of the American Meteorological Society, July 2008. As the ocean becomes more acidic, sound absorption at low frequencies decreases. This has generated concerns about possible impacts on background noise levels in the ocean. However, sound absorption is only a small part of the overall transmission loss in the ocean at low frequencies. Even without absorption, sound rapidly gets weaker as it moves away from a source because of spreading loss. In addition to spreading and absorption, sound waves are reflected, refracted and scattered as they travel through the ocean. Each of these processes affects how far sound travels. Surface ocean pH has decreased by about 0.1 pH units compared with preindustrial levels. Acidity is characterized using the pH scale, which is a logarithmic scale ranging from 0–14. A pH of 7 is neutral (neither acidic nor basic). A pH below 7 is acidic, and a pH above 7 is basic. A lower pH means the ocean is more acidic. The surface ocean pH is about 8.1. 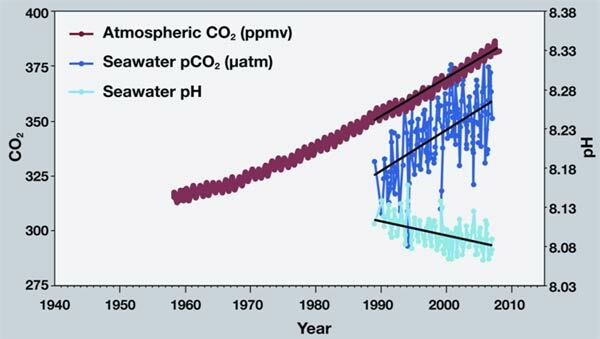 Depending on the scenario used to estimate future carbon dioxide emissions, global ocean models indicate that by the year 2100 increasing ocean acidity could lower surface pH compared to preindustrial levels by up to 0.4–0.7 pH units. The greatest increases in ocean acidity are predicted to be in high latitudes, with more moderate increases in the tropical and subtropical waters. The increase in acidity will initially be less in deeper waters of the ocean, with the models predicting that the pH at a depth of 1000 meters could decline by 0.2–0.5 pH units by 2100, depending on the scenario and location. Acidity affects sound absorption. As sound travels through the ocean, some of the energy in the sound wave is absorbed and converted into heat, causing the sound wave to become weaker. Sound absorption in seawater is much greater than that in pure water. Two chemicals present in seawater in small amounts, magnesium sulfate and borate ions, are primarily responsible for the additional sound absorption. 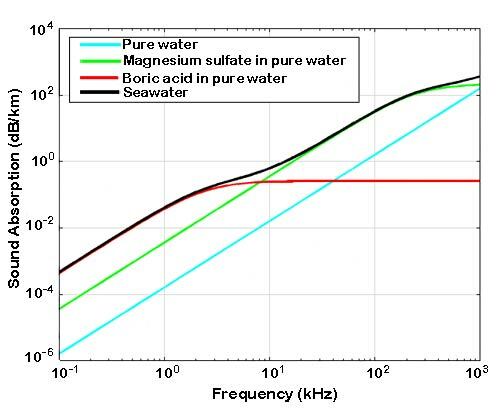 Sound absorption in seawater versus frequency (black line) compared to sound absorption in pure water (blue line) and sound absorption in pure water to which magnesium sulfate (green line) or borate ions (red line) have been added, at naturally occurring concentrations. Calculated from Ainslie and McColm, 1998. From P.G. Brewer and K. Hester. “Ocean acidification and the increasing transparency of the ocean to low-frequency sound.” Oceanography, Vol. 22, No. 4, 2009. Sound absorption due to magnesium sulfate does not depend on ocean pH, but absorption due to borate ions does. This effect occurs at frequencies below a few kHz. A decrease in ocean acidity by about 0.45 pH units results in a decrease in sound absorption by about 50% for frequencies below about 1 kHz. As a result, low-frequency sound would have to travel twice as far to lose the same amount of energy to absorption. Sound propagation in the ocean is sufficiently complex that sophisticated computer models are needed to accurately assess the likely changes in low-frequency noise levels due to the decrease in sound absorption caused by ocean acidification. One reasonably realistic calculation indicates that the expected increase in noise levels from 1960 to 2250 over the frequency range 50–2000 Hz is likely to be less than about 0.2 dB, for a scenario that gives a change in surface pH of 0.7 units over that timeJoseph, J. E., & Chiu, C.-S. (2010). A computational assessment of the sensitivity of ambient noise level to ocean acidification. The Journal of the Acoustical Society of America, 128(3), EL144. https://doi.org/10.1121/1.3425738. Another recent calculation results in a predicted change in noise levels of less than 0.5 dB for all frequencies in the deep ocean, and no observable change in shallow water, for a decrease in pH from 8.1 to 7.4 pH units Reeder, D. B., & Chiu, C.-S. (2010). Ocean acidification and its impact on ocean noise: Phenomenology and analysis. The Journal of the Acoustical Society of America, 128(3), EL137. https://doi.org/10.1121/1.3431091. Expected difference in average ambient noise level(dB) for the deep water case using the historical pH profile from the 1960s and a predicted pH profile for the year 2250. An increase of 0.5 dB is a statistically insignificant change compared to the inherent variability of ocean noise associated with shipping and surface-generated mechanisms. Reprinted with permission from D. B. Reeder and C. S. Chiu. “Impact of acidification on ocean noise.” J. Acoust. Soc. Am. 128 (3), September 2010. Yet a third calculation suggests maximum changes in shipping noise in the North Pacific Ocean over the next 100 years in the frequency range 100–1000 Hz are likely to be 1.5–2.0 dB due to ocean acidification. All of these increases are substantially less than the variability in background noise levels at low frequencies in the ocean at present. NOAA Ocean Data Education (NODE) Project – Understanding Ocean Acidification Using Real Data’ five activities designed for grades 10-12. NOAA Coral Reef Watch – An Introduction to Ocean Acidification. Calculation of absorption of sound in seawater.